A few months back I volunteered to go to my least favourite part of the greater Wellington area (Porirua city, just up the coast from us) in order to buy something for a friend that could only be gotten at a store there. While it has some good points (a really wonderful museum for starters), as far as driving and traffic are concerned, Porirua is the oozing carbuncle on the otherwise pert and rosy bottom of the North Island that is the Wellington area. Getting where I needed to go involves 25 minutes of motorway (you know you are spoiled when 25 minutes of motorway is a grueling drive), and then no less than six roundabouts in a row, and a dozen speed bumps. Take the wrong exit from one of those roundabout and you either end up in a vast, enormous maze of shopping mall parking lot, impossible to find your way out of, or on a street where your only option is to take the most impossible right turn into traffic ever. Now, I like a roundabout or two, but six in a row tends to get nerve wracking. And I always get lost in Porirua, either going around the roundabouts, or just getting to them in the first place. So this time I thought I’d be clever and take the back road from the Wellington suburb of Johnsonville, through the town of Tawa (Staten Island to Wellington’s Manhattan), and then on to Porirua. I’d still have to brave the maze or roundabouts at the end, but the drive to them would be much prettier, and with less traffic. But then, in getting lost, I saw a sign that pointed to ‘Trash Palace’ and I thought to myself “Oooh…that’s the dump shop. I’ve heard that sometimes they have old patterns there”. So I followed the sign. They didn’t have old patterns. 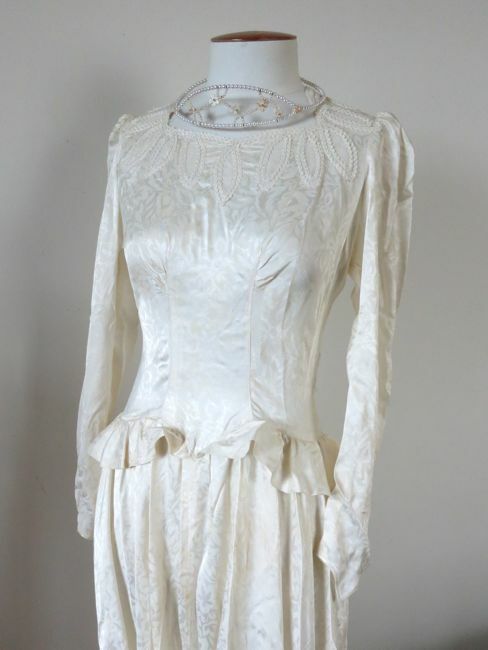 It’s a wedding dress from the late 1940s. They were both hanging on the wall amongst some random stuff, with a tag that said “Wedding dress and tiara $35”. Of course I had to have them! When I took them to check out the cashier wasn’t the sharpest tool, and charged me $35 for the dress “And we’ll say $1 for the headband”. After a brief but futile effort to explain the tiara concept I decided that $36 was still more than fair! Trash Palace is located just before the dump, and it’s a charity shop that people can donate stuff to that is a bit too good to completely toss. In general, it’s much rougher and grubbier and has a much wider assortment of stuff than your average charity shop: lots of half broken furniture and garden implements, shelves and shelves of dusty crockery. There may be treasures if you are willing to hunt for them, and get really dirty. Luckily my dress was in the cleanest part of the shop. 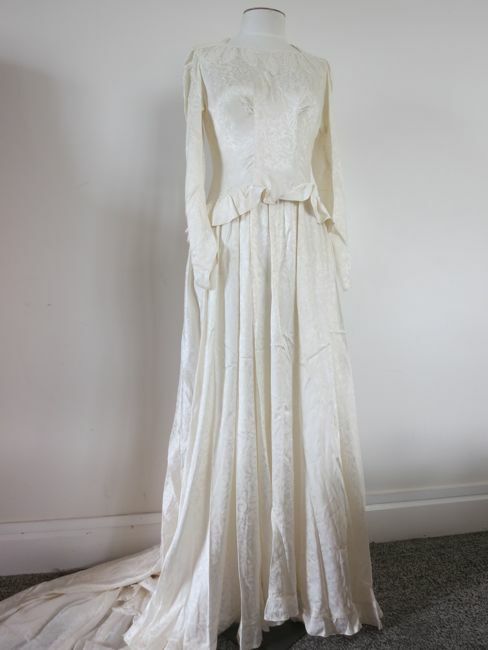 I imagine that my dress was carefully stored and kept by the bride who wore it in her post-war wedding, but perhaps she passed away with no family, so whoever cleared out her estate dropped her dress at the shop while dumping other stuff. It seems so sad for the story to end there, so I’m glad I found it, and can show it off just a little and give it another life. The dress is a classic late 1940s/early 50s style. It’s made of acetate (one of the many manufactured naturals that became popular between WWI & WWII) with a tone-on-tone abstract floral pattern. Acetate was sold in New Zealand from about the mid-1930s. While the cut of the dress, with its long sleeves, full skirt, train and numerous buttons, is luxurious, the acetate fabric is one of the many things hints at the continued fabric shortages and rationing of the late 1940s. New Zealand fared better than most countries as far as food and access to goods throughout WWII (and certainly better than Great Britain), but they still experienced considerable trade interruptions, and certain things were in short supply well into the 1950s. One of these was lace. 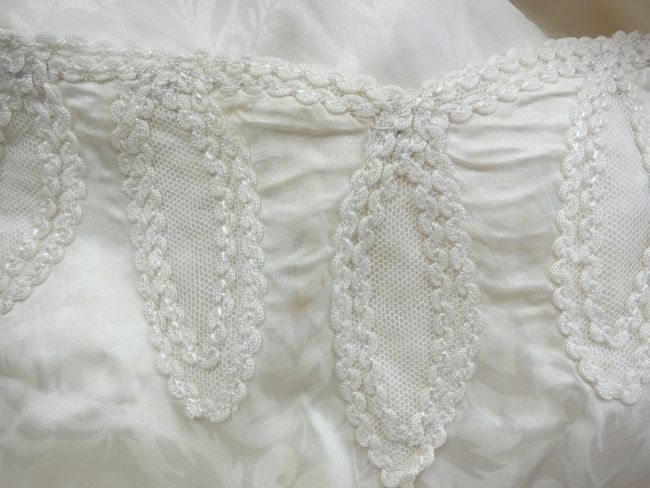 I’ve heard from numerous women who were brides during and after WWII (and their children) how hard it was to find lace for wedding dresses, and how desperately brides wanted lace. 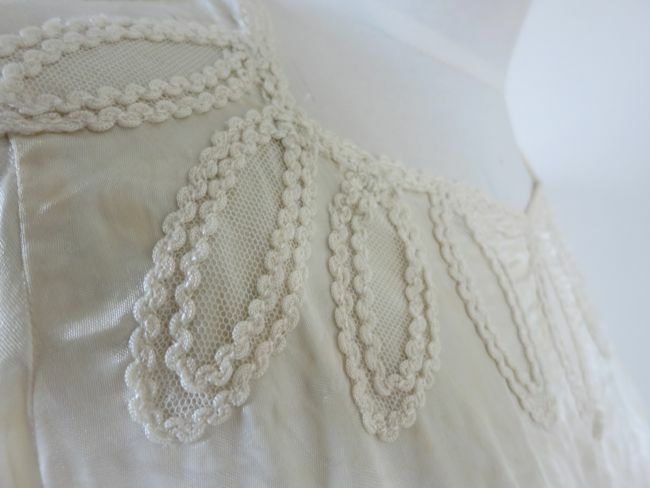 One of the common solutions was to make your own lace-like decoration with piping, braid, trim, net and soutache. 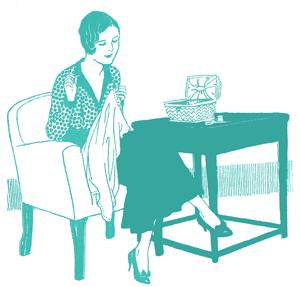 Soutache and braid work were very popular in 1940s fashion, but interviews with older sewers confirms that the decorations on 1940s dresses were usually meant to imitate the un-obtainable lace. 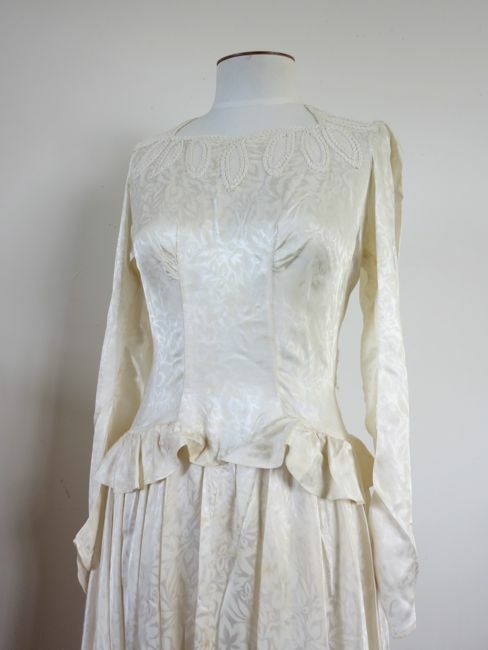 I’ve seen examples of 1940s wedding dresses decorated with hundreds of metres of self-fabric tubing, laid out in elaborate swirls which mimicked common lace motifs. 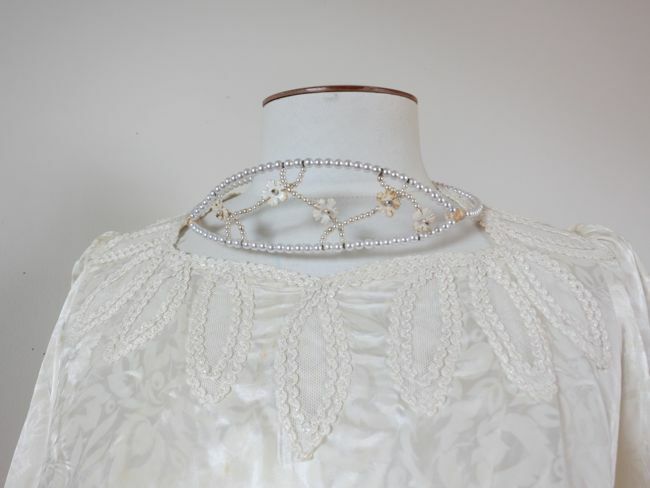 This dress takes a simpler approach, creating a face framing ‘lace’ collar with net and braid. This, more than anything else, dates the dress. By the early ’50s lace was available again, so every dated example of a make-do lace dress I’ve seen in New Zealand was pre 1951. In addition to the ‘lace’ collar another attempt at lace-like lightness and decoration is made with a rayon georgette ruffle around the back of the train. 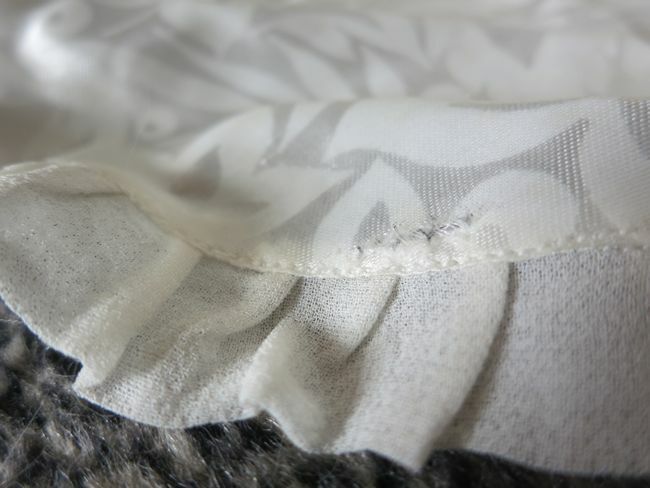 The ruffle not only adds a decorative element to the train, it helps it to fall in beautiful, smooth folds, and to spread out nicely. 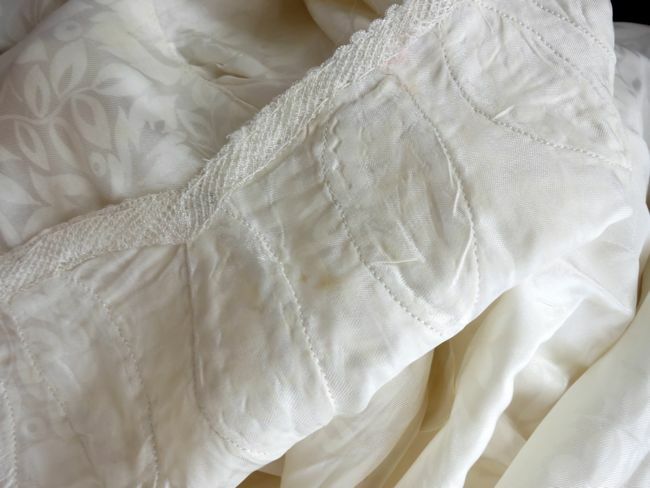 The rayon georgette is an earlier fabric than that of the rest of the dress, and may have been recycled from another garment, or saved from another project. 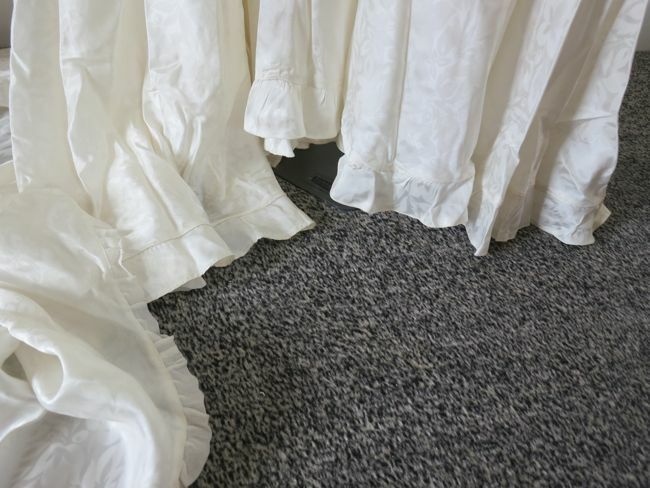 Either because there wasn’t enough of it, or because the dress was hemmed too short, or simply as a design element, the ruffle at the front of the dress is of the same fabric as the rest of the dress, and is longer. 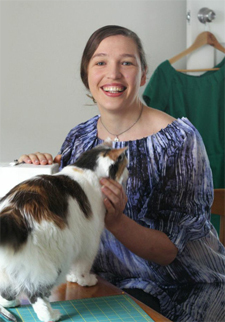 The dress itself is quite short: it would fit a woman of no more than 5’3″. It’s also quite small: it just fits my size 10 dress form, and would be a modern New Zealand size 6 or 8. 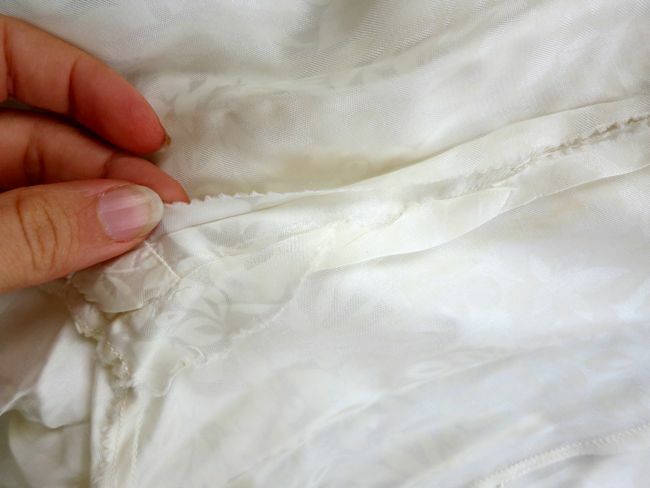 If she were small enough, it could almost be worn by another bride, although there is some minor foxing (an acid reaction that happens with age) and all of the seams would need checking and re-inforcing, as the fabric is giving way at one side bodice seam. 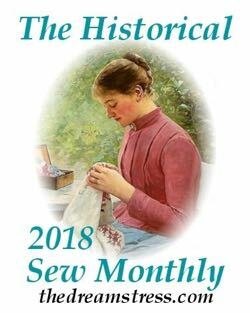 Other than the braid decoration and the button-up back, the construction is very simple and straightforward, and the interior finish is basic, with pinked interior seams. I do wonder who the bride was, and what her wedding was like. Did she make her own dress? Or did her mother make it? Did they go to a dressmaker? So many stories in one beautiful frock! And what a lucky chance to find it as my reward for braving Porirua for a friend! Porirua was a carbuncle when I was growing up in Papakowhai as a child, it hadn’t improved much 10 years ago when my father and I drove in on our way home from moving my grandmother down south. It took ages to escape the place! Everything was newer than I remembered, but still not a place we wanted to be. Oh my isn’t it lovely. We need to find someone to model it for a photo shoot, I think. Amazing sweeping train! Wow! What a find! I am so glad you rescued it. I’ve never made it to trash palace and the wellington one is quite small now. Thanks for sharing this and your knowledge with us. You’re most welcome! I was pretty excited about it! The funny thing is that I’ve never been to the Wellington dump shop! It’s a gorgeous dress. Well done you for rescuing it. Wouldn’t it be wonderful if someone wanted to wear it again? Didn’t you rescue another wedding dress recently? What do you do with them? Thanks Gemma! This is the one I rescued – it just took me a while to blog about it. It would be wonderful if someone wore it, but as a museum professional I do struggle with people wearing vintage. 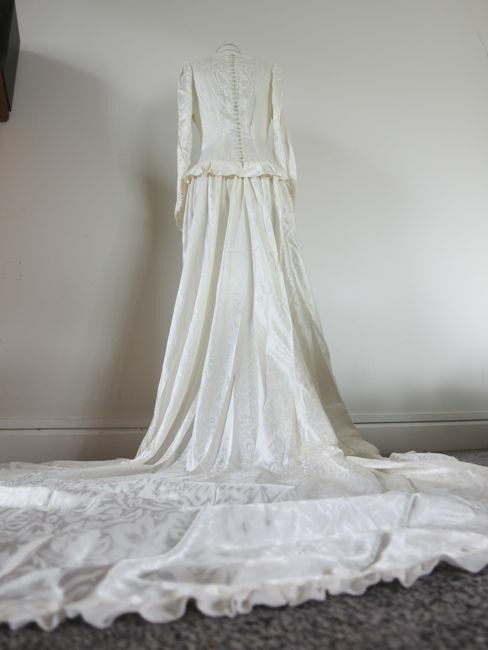 This era of wedding dresses is well represented in museums in New Zealand, and without a proper provenance my gown looses most of its historical valued, so wearing it isn’t as much of a travesty as some examples I’ve seen. Thank you again for letting me ship my own vintage things to you. Much better off making someone happy than ending in the trash (or dump shop). This is a very interesting dress! Looking forward to seeing it on a tiny model. How lovely! 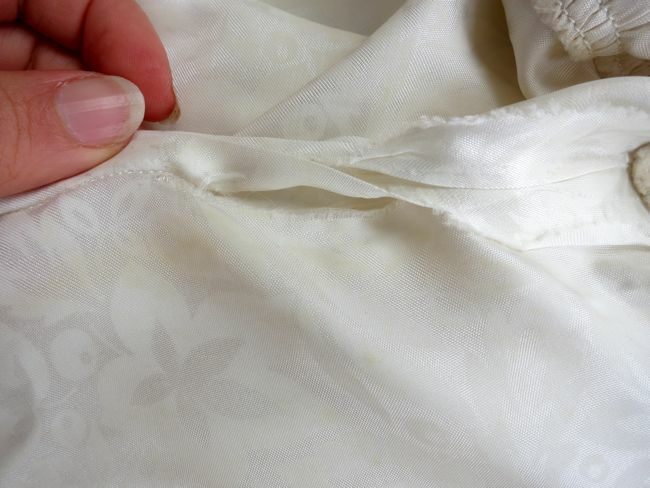 Thanks for sharing the photos and history of what to do without lace. The friend is doubly glad you made the trip! The dress has so many charming details. I do like the shape of the neckline, too. Sort of high early Tudor. I like its modesty and its elegance. 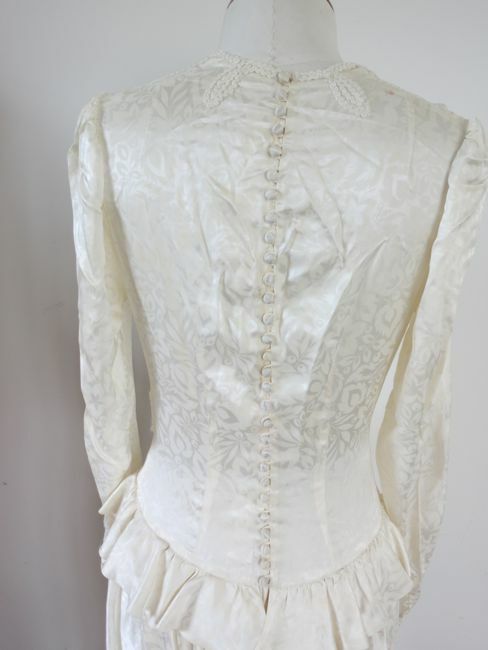 Very bridal, unlike some of the dresses one sees today. 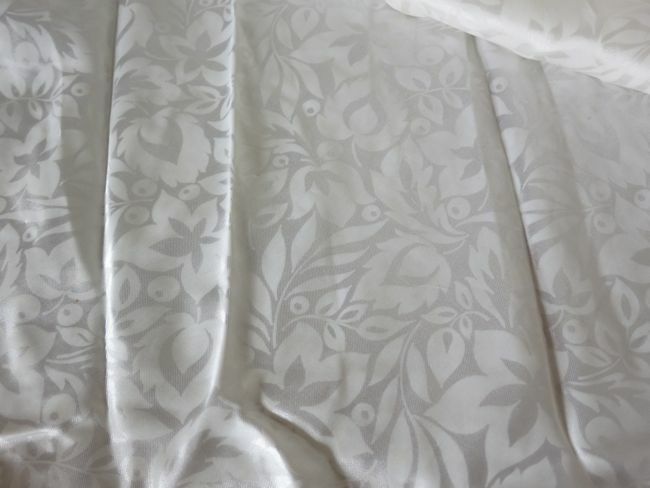 It is hard to imagine how rare silk was, when I was growing up in the forties, fifties, and sixties. It just wasn’t available. Even in the seventies, it was rare, and very expensive, still spoken of in hushed tones. It is only in the last twenty years that it has become so cheap and so available. 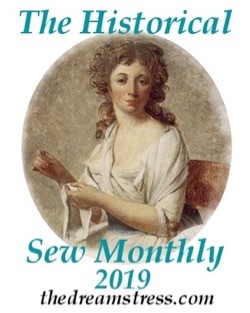 I hope many of you noted those wonderful young women in one of the historical sew-fortnightly challenges, who reproduced an embroidered stomacher, one doing the embroidery after the other had raised the silk worms, combed and spun the silk, and dyed it with natural dyes. Very, very precious! I am so pleased that you found this dress and rescued it. I think it is really sad that it ended up in a shop like that. 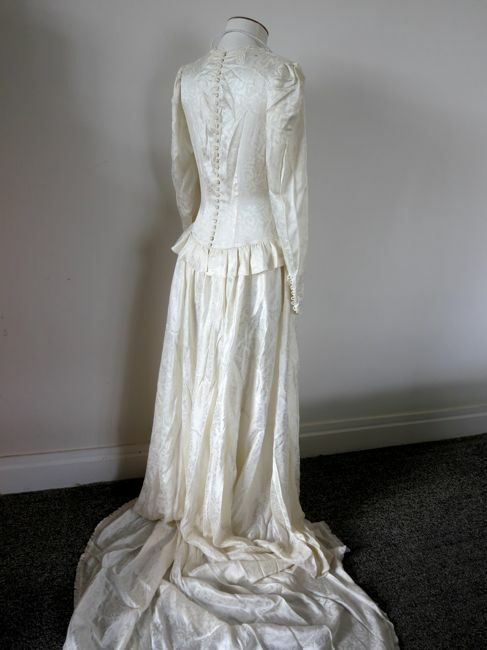 It is a lovely dress and I enjoyed reading all you had to say about it, I didn’t know all the stuff about the lace. What a find! I’m fascinated by the imitation lace, and the way it’s been shaped under the bust. And I laughed myself silly at your description of Porirua. Very true, sadly. I sometimes wonder what the town planner who designed that roundabout system was smoking. I don’t know what they were smoking, but I do know what they were singing…..
What a fabulous find. And how lucky for the frock to have found a home with you. I am always curious about the back story, how/why it ended up there? what happened to the bride? It looks to be in such lovely condition which makes you wonder even more that it was sent to the dump.